Explode your commissions by closing winning deals every time you get in front of a prospect! Close the Deal presents you with a revolutionary, yet remarkably simple, 7 Step System for regaining control, removing pressure, and ultimately closing more sales and generating more profit than you ever will by using those tired old-school techniques. 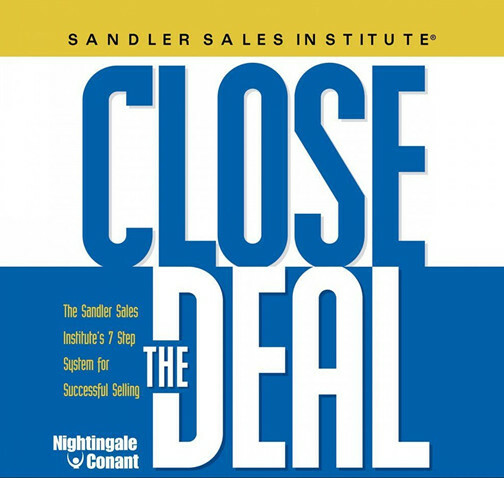 The Sandler 7 Step Close The Deal System is based on the fundamental principle that the most successful selling experience is one that is completely pressure free, both for the prospect and for you. If you’re feeling abused or pressured by your prospect, you’re doing something wrong. You should never have to forfeit your self respect or fake enthusiasm about your product in order to make a sale. Likewise, your prospect should never feel manipulated by you when you close the deal. In fact, the buyers should be the ones to close the sale. Your role should be to help them help themselves. Everyone out on the front lines of selling knows that the traditional techniques that salespeople have relied on for decades just don’t work anymore. They’re worn out, dated, and increasingly irrelevant in today’s radically changing marketplace.